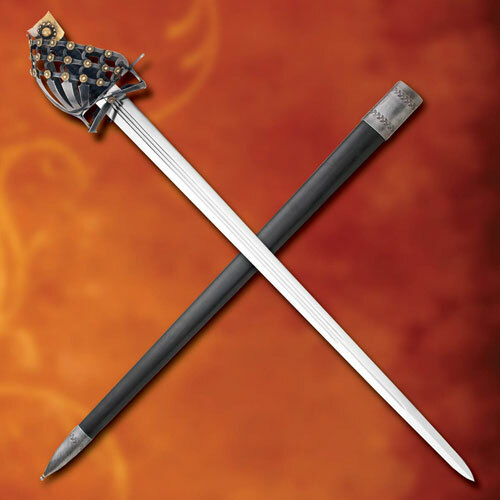 Schiavona Swords are 39 ¼ inches in all and weigh 2 ¾ pounds. These swords feature a half basket hilt and are inspired by the medieval Schiavona that was popular with Italian mercenaries. This modern version features a functional, hand forged 33 ½ inch 1065 high carbon steel blade. The guard features a darkened battle worn finish. The handle is wrapped in soft black, real premium leather and is capped by an antique brass pommel. The half basket hilt is adorned with beautiful, highly detailed antique brass flowers. The black real leather scabbard is flanked with battle worn finished fittings that are engraved with a lovely pattern. 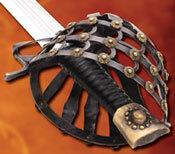 Buy the gorgeous Mercenary Schiavona Half Basket Hilt Swords for $299.99.